Total nonfarm payroll employment rose by 113,000 in January, and the unemployment rate was little changed at 6.6 percent, the U.S. Bureau of Labor Statistics reported today. Employment grew in construcBoth the number of unemployed persons, at 10.2 million, and the unemployment rate, at 6.6 percent, changed little in January. Since October, the jobless rate has decreased by 0.6 percentage point. Among the major worker groups, the unemployment rates for adult men (6.2 percent), adult women (5.9 percent), teenagers (20.7 percent), whites (5.7 percent), blacks (12.1 percent), and Hispanic [of any race] (8.4 percent) showed little change in January. The jobless rate for Asians was 4.8 percent (not seasonally adjusted), down by 1.7 percentage points over the year.tion, manufacturing, wholesale trade, and mining. The number of persons employed part time for economic reasons (sometimes referred to as involuntary part-time workers) fell by 514,000 to 7.3 million in January. These individuals were working part time because their hours had been cut back or because they were unable to find full-time work. In January, 2.6 million persons were marginally attached to the labor force, little changed from a year earlier. (The data are not seasonally adjusted.) These individuals were not in the labor force, wanted and were available for work, and had looked for a job sometime in the prior 12 months. They were not counted as unemployed because they had not searched for work in the 4 weeks preceding the survey. Among the marginally attached, there were 837,000 discouraged workers in January, about unchanged from a year earlier. Discouraged workers are persons not currently looking for work because they believe no jobs are available for them. The remaining 1.8 million persons marginally attached to the labor force in January had not searched for work for reasons such as school attendance or family responsibilities. The Great Recession and the Global Financial Crisis began in December 2007. By December 2008 the unemployment rate reached 7.2% and reached its peak in October 2009 with an unemployment rate of 10.2%. The financial crisis was triggered by a complex problems in the United States banking system, the U.S. housing bubble and other financial failures. President Barack Obama assumed office January 20, 2009. In January 2009 the number of unemployed persons was 11.6 million and the unemployment rate was 7.6%. Unemployment peaked in October 2009 with an unemployment rate of 10.2% and 15.7 million unemployed persons. Between January 2009 and March, 2009 more than 2 million jobs were lost and 663,000 were lost in March 2009 alone. The number of unemployed persons increased to 13.2 million that month. January 2001 the nation’s unemployment rate was 4.2% with a total of 6.0 million unemployed persons. Unemployment rate was the following: whites 3.6% and for blacks 8.4%. January 2008 the nation’s unemployment rate was 4.9% with a total of 7.6 million unemployed persons. Unemployment rate was the following: whites 4.4% and for blacks 9.2%. 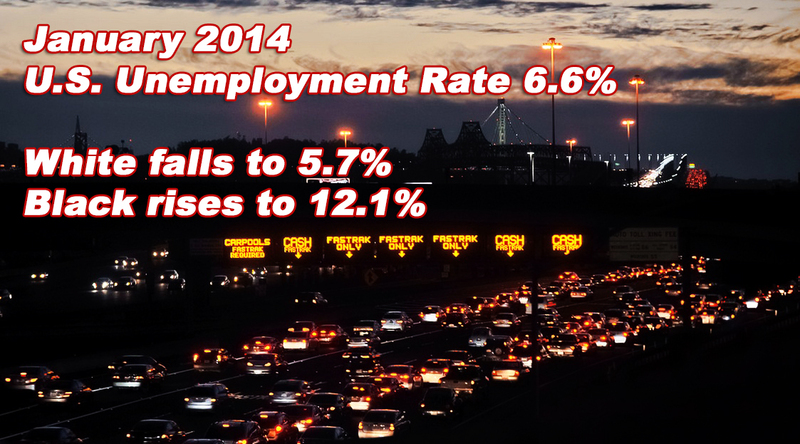 January 2009 the nation’s unemployment rate was 7.6% with a total of 11.6 million unemployed persons. For whites the unemployment rate was 6.9% and for African Americans it was 12.6%. January 1994 the nation’s unemployment rate was 5.4% with a total of 7.2 million unemployed persons. Unemployment rate was the following: whites 4.8% and for blacks 9.8%. In September 2000 the unemployment rate was 3.9%. This was the first time the nation’s unemployment rate had been below 4.0% since January 1970. Unemployment rate was the following: whites 3.5% and for blacks 7.0%. January 2000 the nation’s unemployment rate was 4.0% with a total of 5.7 million unemployed persons. Unemployment rate was the following: whites 3.5% and for blacks 7.6%. January 2001 the nation’s unemployment rate was 4.2%. The number of unemployed persons rose to 5.95 million. Unemployment rate was the following: whites 3.6% and for blacks 8.4%. Seasonal adjustmentis a statistical method for removing the seasonal component of a time series used when analyzing non-seasonal trends. Whereas, not-seasonally-adjusted reflects the actual current data. It is normal to report not-seasonally-adjusted data for current unemployment rates. Seasonally adjusted data may be used for the longer term comparison. Total employment and unemployment vary throughout the year. For example,higher unemployment in January and February isn’t uncommon because of work in agriculture, construction and other seasonal industries slowing down. Also, both employment and unemployment rise every June, when students enter the labor force in search of summer jobs. Seasonally adjusted numbers also take into account seasonal hiring/layoff patterns that go along with winter and summer holidays. You put a lot of work into your post, as Ms. Valentine says, brilliant work.